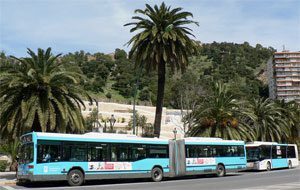 37 percent of tourists visiting the Costa del Sol choose to rent a car at Malaga airport, due in a large degree to the lousy public transport. In fact, the buses often arrive late to the bus stops, the information provided in the bus stations is scarce and timetables of the lines are reduced even more. The tourist, who is staying in hotels or apartments located in residential areas or residential areas away from urban areas, has a huge dependence on the car because there is no other effective, economical and safe transportation. In these cases, holidaymakers have no choice but to use the car to go from the beach to the accommodations. The municipalities propose, as a measure to decongest the roads of the Costa del Sol, to strengthen the public and inter-urban transport.